Okay, so here’s the thing: this isn’t about intermarriage. 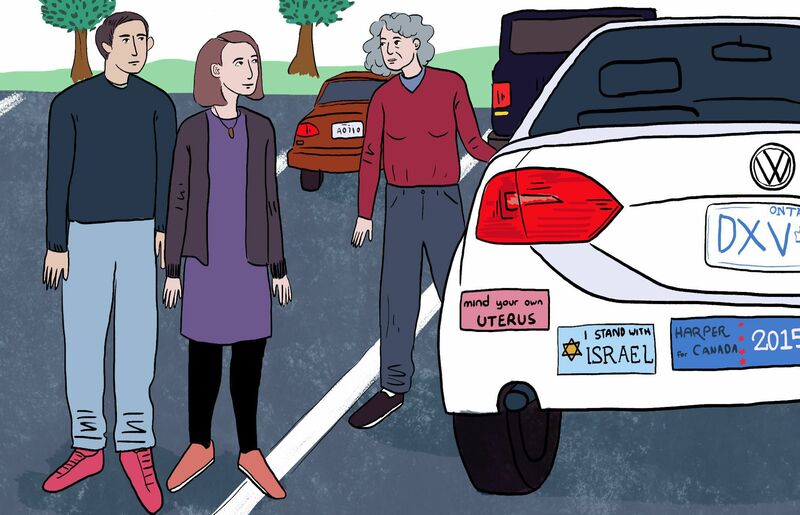 Your mother-in-law’s particular and overwhelming attachment to Israel might be more familiar and expected to you if you’d grown up Jewish, but that doesn’t mean it would resonate with you, any more than any other single-issue voter’s favorite passion. You’d find this just as frustrating if you’d grown up Jewish. Because it’s not about faith. it’s about logic. You’re annoyed at a lack of logic. In an intermarriage it can be very easy to examine everything through that one lens. We give extra weight and importance to our divergent faiths and cultures, in the same way that we might make individual differences about gender. (“Men are from Mars…” etc.) It’s easier to point to the categorical “divide” than to get into the nuances of particularities. But I don’t think this gets us very far. In this case, I think her inconsistency as a voter has less to do with the fact that she’s Jewish and more to do with the fact that she’s a (sometimes illogical) human being. I know progressives who vote against their politics to protect their stockpile of guns, and libertarians who vote for higher taxes, because they care even more about the environment. And I know a slew of liberal Catholic voters who loathe their anti-choice candidates, but pull that lever anyway. This can be really frustrating to witness, but ultimately it’s THEIR vote. There’s a reason we vote anonymously. It sounds like you have a great relationship with your Jewish family. Yasher koach on that! In my opinion, the best course of action here is to protect that relationship with tolerance. My guess is that somewhere down the line, she’ll need to bite her tongue at one of your more illogical moments. So it goes with family. Laurel Snyder is the author of books like “Bigger than a Bread Box” and “Baxter, the Pig Who Wanted To Be Kosher” and Project Manager for Atlanta at InterfaithFamily. Find her online at laurelsnyder.com or on Twitter @laurelsnyder.